So it seems that I have an international following. Know what that means? It means my parents and grandparents are not the only people who read my blog! Okay, so the people who have stopped by once from Tunisia, Australia, Costa Rica, Warsaw and Turkey probably don't come back to check up on me every other day...but let's not put a damper on the excitement that I have an international following. This week, Pesach starts. Seder night is Monday night, and this begins, among other things, a week of matza, a week without bread, pasta, rice (if you're Ashkenazi) and carbs in general. Pesach is an Atkins dieter's dream. No carbs, just meat, fish, fruit and veggies, and a lot of this thing we call 'the bread of affliction'. There's a joke I heard from my beloved Rabbi in Eugene: "Want to know why it's called 'the bread of affliction?' Try eating it for a week. Then you'll understand". This may not be that funny to people who've never experienced this, but for the rest of us....I know you're out there, and I know you understand. 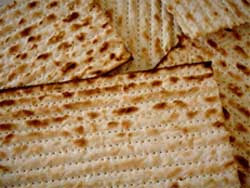 See, matza is simply a baked mixture of flour and water. It has no fiber WHATSOEVER. So, take a lesson from the veterans and experts (of which I am not yet one) and eat A LOT of prunes, dried apricots and other things to help you go along on your way. This will be an interesting week for me, because, although I was in Israel for Pesach in 2003, I was basically stuck on a moshav without a car and severely lacking in Hebrew skills. I was very much an outsider. Today, I am less so, but today I am a part of this place, just like this place is a part of me. Despite the fact that I can't read the newspaper (most of it anyway), I don't understand the news on the TV, much less on the radio, and in general have NO IDEA of what's going on around me...I'm making it. Speaking of not understanding what's going on, last weekend a few friends and I were in Tel Aviv. We laid on the beach all day Saturday, and I got a massive sunburn on one side of my body (turning is essential), complete with BIG raccoon eyes. Anyway, that's not the point. On Saturday night, we caught a cab from the beach area to the Central Bus Station to hop on a bus back to Jerusalem. Maya, Yonit and their friend got in the back seat, and I took the front. When I got in, the door was a little hard to close, like the car had been hit at some point in the past...I said something about this to the driver, in Hebrew ("The door is broken" = הדלת מקולקלת). So, he responds with a long monologue about something. Anyway, I though that I understood what he was saying - something about how he needed to get it fixed and how he wouldn't forget, etc. So I responded with: "It's not so bad. It still closes". His look was priceless. He had NO IDEA what I was talking about. So I repeated it, in perfect Hebrew. Apparently what I said had absolutely NO RELATION to whatever he had been talking about, so I just shut my mouth and relegated the experience to one of the many idiot, oops! I mean immigrant moments and laughed at myself. I'm sure there will be many more where that came from.